Sunday, May 21, 1911: Went to Sunday school this afternoon. The whole Stout family was over this evening. Wormed the results of that letter out of Carrie. This entry describes one of the really nice characteristics of rural life—neighbors just dropping by to visit. One hundred years ago, on warm spring evenings neighbors probably often gathered to chat about the weather, share the local news, or talk about …. well, just whatever. Long-term friendships were formed over the years—and people would discuss anything and everything. Sift together, three times, the flour, salt, cinnamon, and baking powder. To the eggs add the sugar, chocolate, almonds, extract, and lastly the flour mixture. Drop by teaspoonfuls upon a buttered baking pan. Bake in a moderate oven. This recipe makes about three dozen little cakes. When I tried this recipe, I heated the oven to 375 degrees and baked the cookies for about 12-14 minutes. 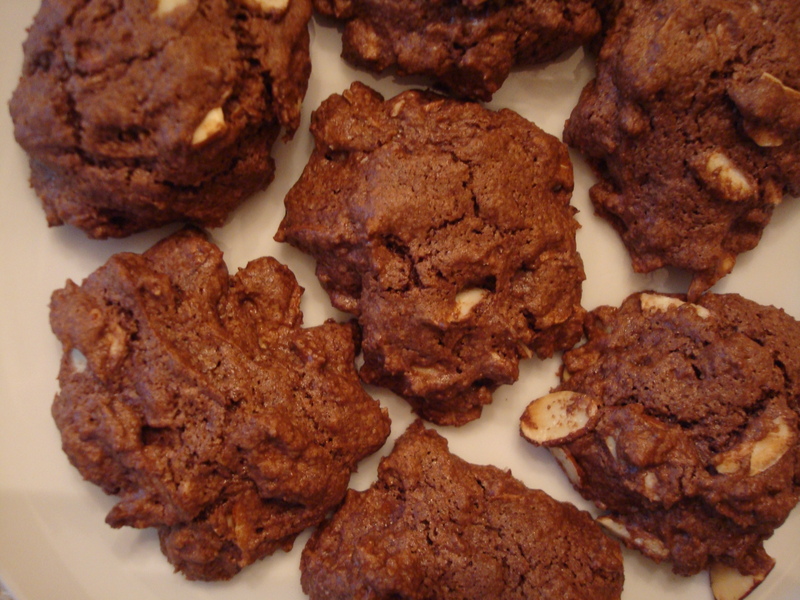 I didn’t sift the flour—and I used unsweetened chocolate, sliced almonds, and a different brand of baking powder. I was surprised that the recipe didn’t call for any butter or other shortening. The cookies are tasty with a slight hint of cinnamon, and the recipe is definitely a keeper. Posted on May 21, 2011 August 30, 2015 by SherylPosted in Food, recipesTagged almond, cookies.